Super What Word Game Review - Download and Play Free Version! Link the lettered balls to form words - especially the Super What Word! Sound effects add to the play. Challenging 'what' words add a competitive element. 2 modes of play for the more relaxed and pressure seeking players. Difficulty settings don't significantly change the difficulty level. Your goal is to rearrange the letters on the grid to form words. You move to the next level once you have formed the required amount of words. You receive points based on how big of words you form, and how many words you form at the same time. Using starred letters gets you bonus points. An added bonus to the game is starred letters. Every time you form a word with a star, the star letter is kept to make a bigger word for even more bonus! Mind bending and fun! Super What Word is a challenging word game that requires a great deal of strategy as you create words on a 25 letter grid. The object of the game is to rearrange the letters on the game board to form words. There are words that are designated “what” words. You must spell these given words to advance to the next level. The game is a load of fun, while still providing a good challenge. There are two modes of play in Super What Word that have nearly the same objectives and ways to play. The first is Untimed Puzzle mode. 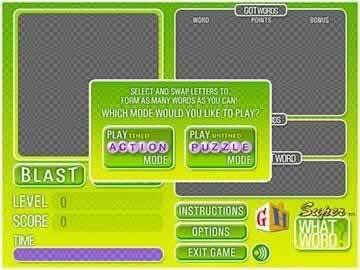 In this game you will create words by rearranging letters on the grid. You click on one of the letters and then on another letter to swap the positions. Whenever you form a word it disappears and new letters fall into place. 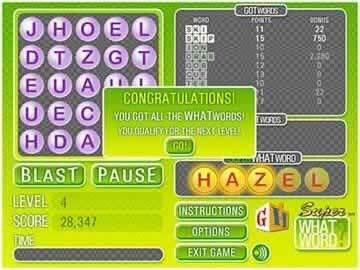 The game incorporates “what” words which are words it asks you to complete. You must spell these before you can advance in the game. The Untimed mode, as you might have guessed, is without a time limit. You have unlimited time to find the “what” words and advance to the next level. The second mode of play is Timed Action. You play this game the same as the Untimed Puzzle mode, however, you are under pressure as you race against the clock. This mode is timed, creating more pressure and making it more difficult to find the “what” words and advance to the next level. As far as scoring is concerned you receive points for each word you form based on the number of letters it contains. Longer words score more points, the longest being five letters long. Also, more scarce letters like Z, Q, W and V are worth more points and result in a greater score. 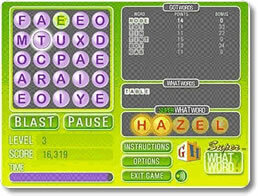 This game also incorporates bonus letters that are highlighted. These letters double the score of the word you form and are extremely valuable. They are rewarded for using longer words and scoring a lot of points. The strategy element of this game is strong, though it might not seem so from the start. Initially, the game is pretty easy and you form words at a fast rate. You might even form words you don't know you are forming until after you are rewarded for them. However, once you start focusing on spelling the “what” words and advancing to the next level the game becomes tricky. The same random forming of words starts to hurt rather than help you, and you must be on your toes scanning for letters. The random words you form by mistake end up causing you to loose key letters you need to use to form the “what” words. An example of this can even be seen within the “what” words themselves. If you are faced with spelling the word “Lured” make sure you insert the E last, otherwise you spell “red” or “lure” and over half of your letters disappear. You must use a lot of strategic thinking to build your words slowly because if you don't, you might accidentally form another word that causes you to lose a significant portion of your needed letters. Not having a multiplayer mode is a small drawback of the game. The game's format is not necessarily conducive for a multiplayer game, however, making a new mode or changing the format slightly so you could play with a friend would improve the quality. Also, the difficulty levels are not different enough and still might make the game hard for less experienced spellers. Overall, Super What Word is a strategy rich word game that is a lot of fun. This game can be difficult and is geared for more advanced spellers. Don't expect to play with a friend because it lacks a multiplayer mode, however, the single player features should keep you more than content. This game is a gem in the word game category and is something that deserves to be played.